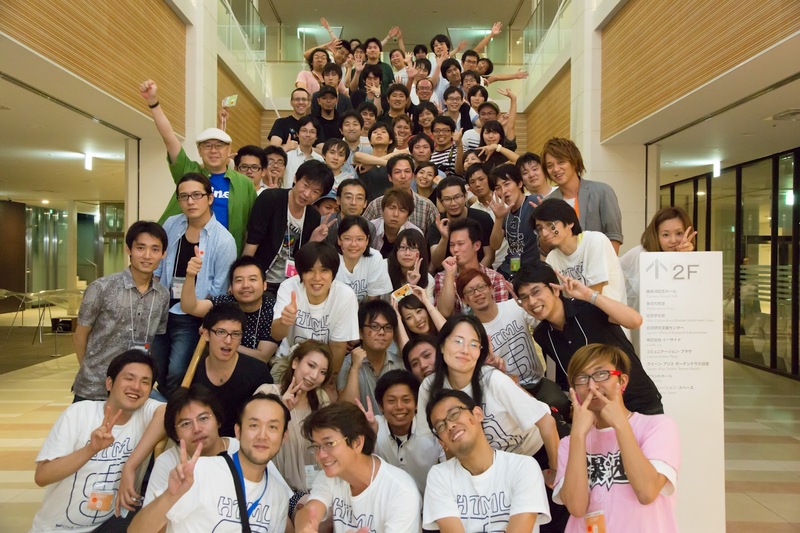 One of the newest trends within the developer community in Japan is various ways of collaboration among the developers and designers. As the apps and websites' quality increases, demand for better UI and better design would be expected. 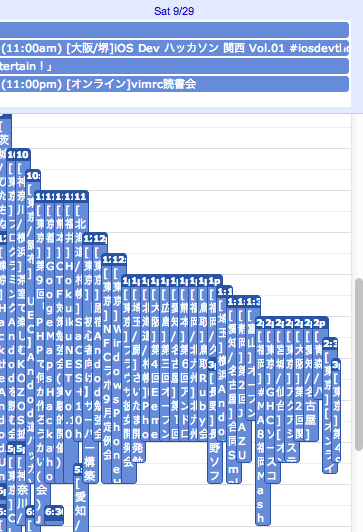 A developer called @Adamrocker (Masahiko Adachi) created a Japanese IME for Android called Simeji as his side project while working for a tech company full time. 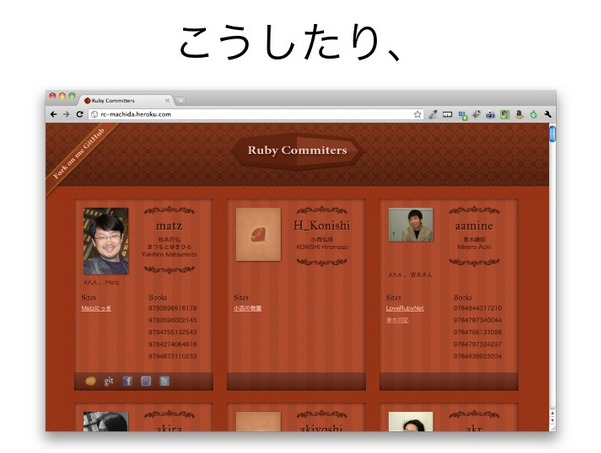 It became one of the most popular Japanese IMEs, but his friend and a designer Rin Yano felt that there should be improvements in the UI as well as the logo. She started to help the project as the designer, and greatly improved the service. 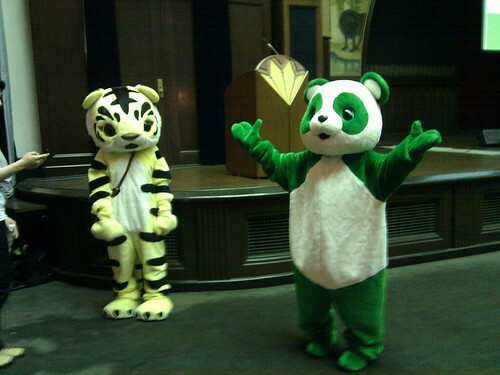 Last year, Baidu - the largest search engine in China bought Simeji, and the two of them joined Baidu. Some of the hackathons keep the developer vs designer ratio to be 50:50, or don't have a target ratio but invites designers to join. This is awesome, since it increases the quality of UI which is always better for the users, the gender ratio of the participants gets more balanced (developer only hackathons ends up with a very high male ratio), and developers and designers get a chance to meet (usually they don't go to same events) which leads to future collaboration in other projects, not just the hackathon itself. At one of those hackathons I organized that invited designers and developers, designers would start designing characters and logos for games that developers were making, start making mocks and wireframes while developers were coding, design beautiful background images while developers tackled new APIs. They can reach a different level just in one day hackathon. 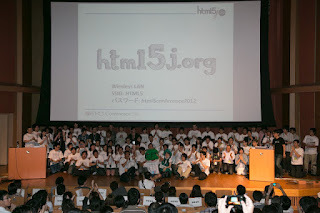 html5j, the largest HTML5 community in Japan started as "HTML5 developers JP" community. Last year, they felt the need to open the doors to the designers and collaborate with them. They changed the community name to "HTML5 developers and designers JP" which is too long so shortened it to "html5j", they organized a conference called "Chrome+HTML5 Conference" which had a developer track as well as designer track, and secured seats for designers (there were 1000+ registration for 200 seats, so this was important). 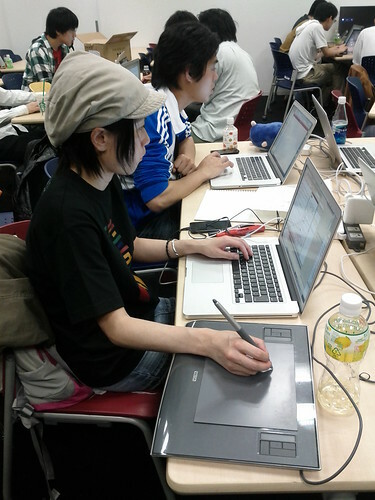 Chihiro Akiba, Asami Yamamoto and Adamrocker started a series of events for Android app designers to learn xml so that they can increase what they can do with their app design, and to ensure that what they designed will not be wasted when it is implemented by the developers. "In the past, the role of developers and designers were separated, and designers were frustrated because their proposals for better design would not be implemented by the lack of understanding about the importance of design on the developers' side- and the developers were frustrated because designers would propose designs that were pretty but wasn't functional as the developers expect." 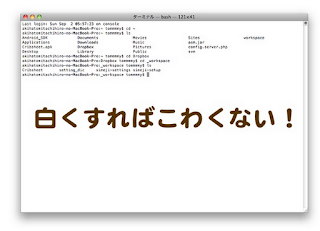 says Chihiro. "If Android app designers learn xml, designers will be able to realize what they wanted the design to be, and the developers will be happy since you are decreasing their burden." 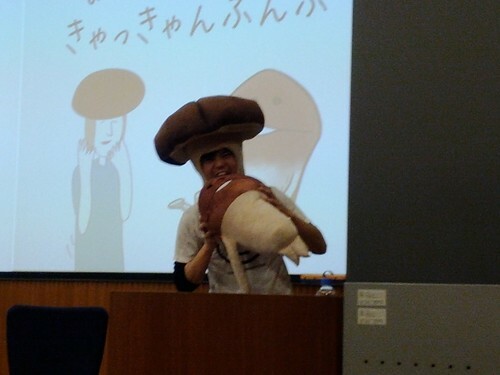 In fact, some developers who joined the event told me they learned a lot from her lecture too. "I actually didn't know we can do such design work with xml." Her first lecture was about 9-patch. At her second lecture she further explained what designers can do using xml. 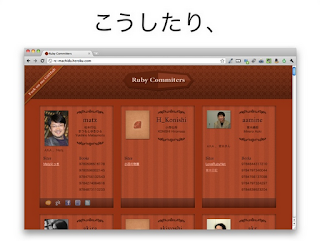 The third lecture will be about Custom UI. 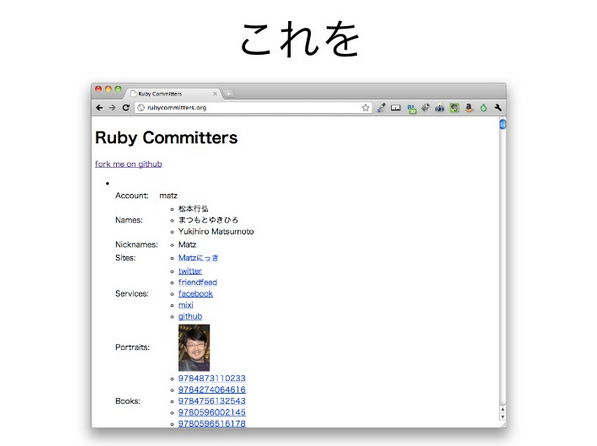 "How can developers and designers better collaborate?" is a common question nowadays. 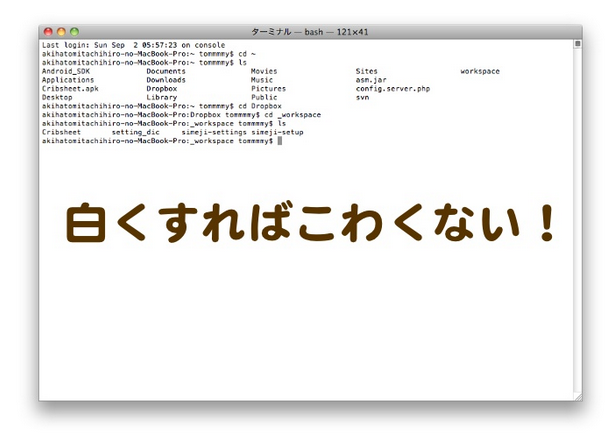 Designer Teppei Machida proposed something called "Design Terrorism". "Use of Github is very common among developers- they can create, publish, share, add to other people's code, and collaborate. It's awesome. Designers should be allowed to join too! 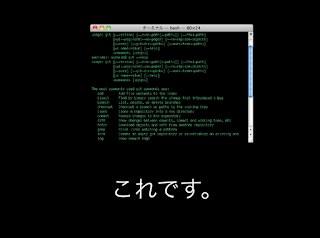 But you need to be able to use that scary green screen..."
"So I made a service called Kuroigamen(black screen) to enable designers to post their designs to github without using terminal. 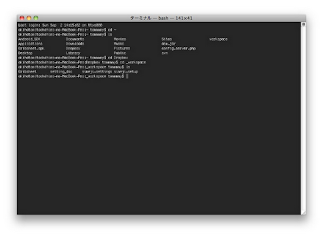 Developers will be surprised if they received a design on Github." 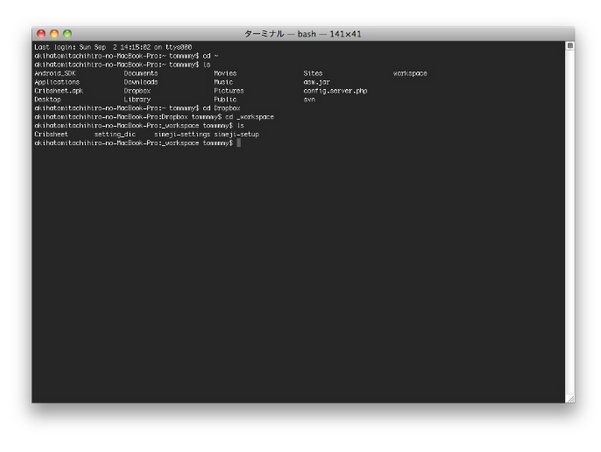 BTW, the terminal being black might have been the scarecrow for designers. 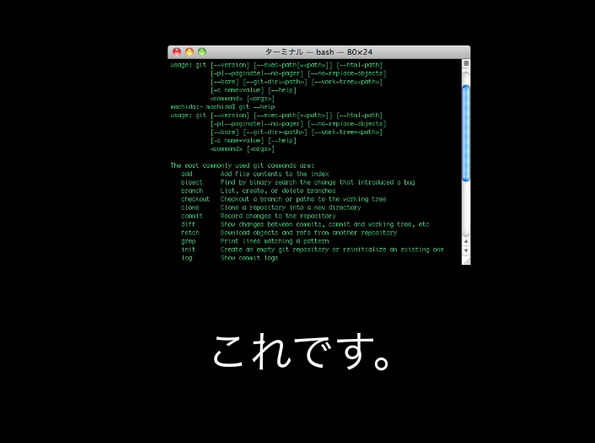 In Chihiro's lectures, she mentions "don't be afraid of the black screen"
"Make it white and it's not scary any more." "You even can make it brown. Don't be scared!" 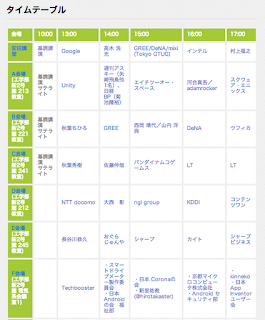 I wrote a blog post that there are so many tech events in Japan, thought it might be good to write another post about Android developer communities. 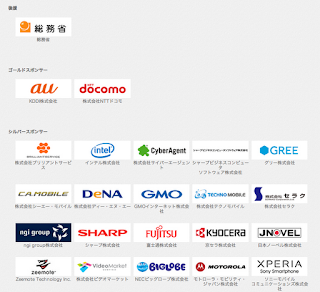 There are various Android communities in Japan, the largest one is "Japan Android Group[ja]" with 21,501 members in Google Groups[ja], 70% of which are developers. There are 78 members in the organizing committee[ja], led by Makoto Anjo. They have 36 regional groups all around Japan, from Hokkaido to Okinawa. They organize various events[ja], once a month in Tokyo with 300 participants, and more all around Japan. 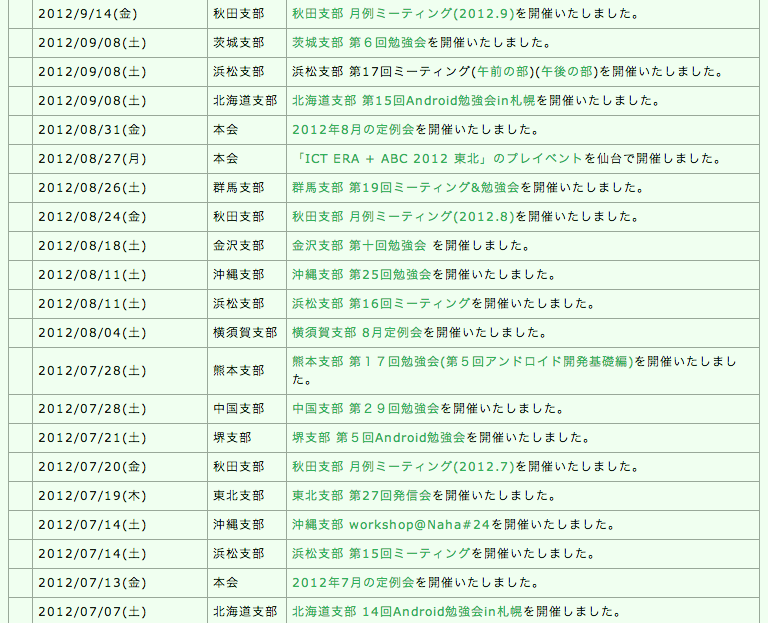 Total number of the events hosted by Japan Android Group counts nearly 500 events. 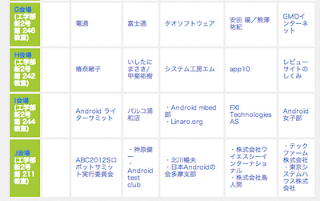 They also organize the largest Android conference in Japan called "Android Bazaar and Conference [ja]", twice a year. Some of this conference counted more than 3,000 attendees, and the planning and execution is done 100% by the community members and volunteer staffs. 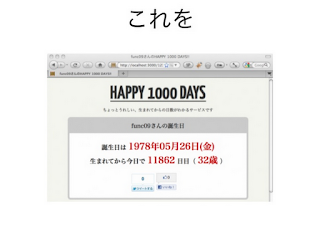 The recent one was held in March 2012, with 11 simultaneous tracks. 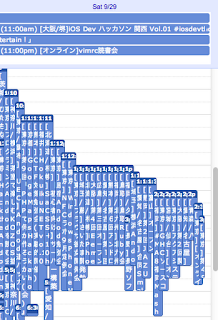 Time table, slides and videos can be seen from here [ja]. They also had Bazaar portion with 65 demo booths [ja]. 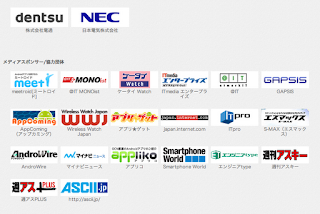 They had support from Ministry of Internal Affairs and Communications, Gold Sponsors were the 2 major mobile carriers in Japan, and many silver and media sponsors. Deb is a group focused on developers who seriously wants to build high quality Android apps, whereas Japan Android Group welcomes anyone who is interested in Android. They require members to have built and published at least one Android app on Android Market, or have knowledge on devices, or UI design. 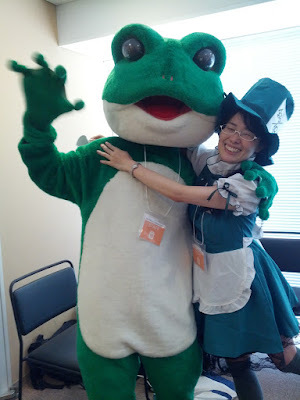 Deb currently has around 130 members[ja], and organizes monthly meeting to do programming or sessions. Leaders are Takashi Egawa and Masahiko Adachi, both of whom are developers. 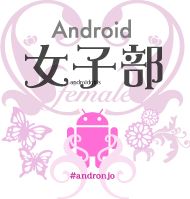 Android Female Club[ja]or Andronjo is literally a women only Android community, with 635 members, and led by Rin Yano, who is a designer. Some of them are developers, some are designer, some are users. They host various women only events on Android. 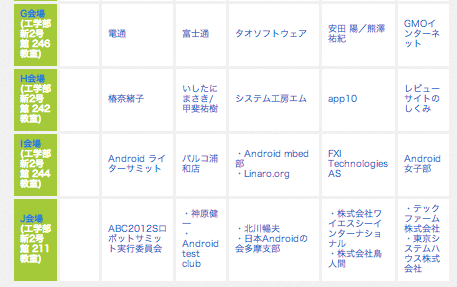 There are many more including Android Security Club[ja] (which was founded by a 17 year old developer who was concerned about Android's security), NFC Lab[ja], and a whole bunch of other communities. 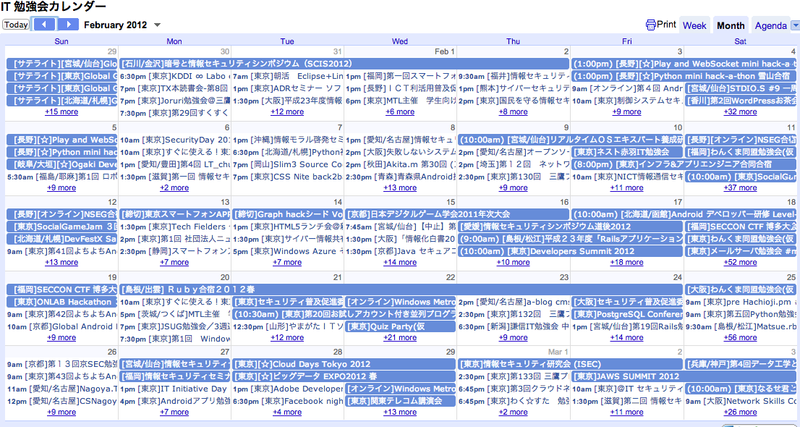 It's actually amazing how Japanese developers hosts so many study groups and study meetups and conferences. 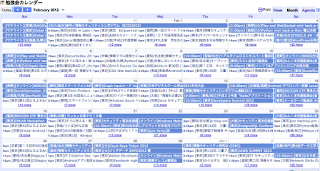 This is a screenshot of IT Study group calendar. This is the schedule for today- 9/29. There's just so many options, so many events, and this is tech/IT event only. There's actually 50 in just one day. It's just so hard to see what's happening just looking at this summary since there's way too many tech events in just one day, so I opened it up as follows. 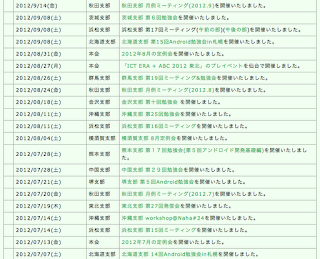 Among the 50 events in just one day today, of which half is Tokyo/Kanto area. I won't translate the whole thing, but translated parts of it so that you know what technology it is about (like Android, Perl, Ruby event etc). 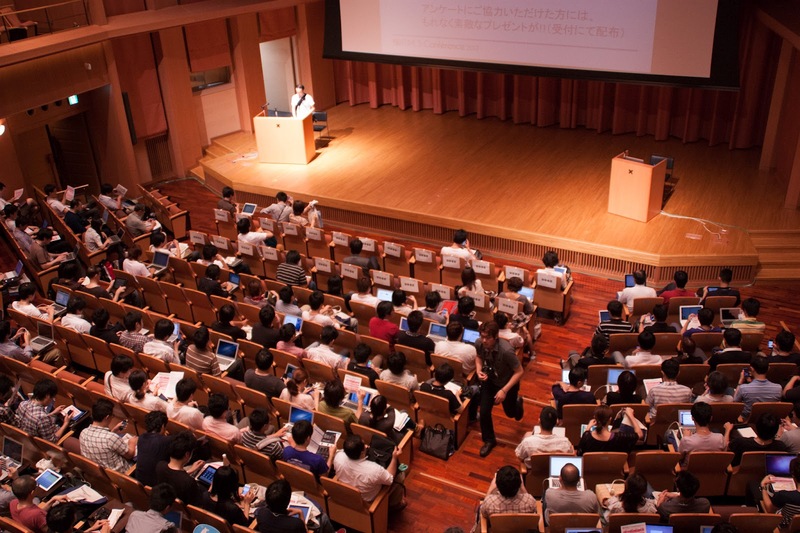 Japan's strength comes from the "users"
I joined Atomico Open Office in Tokyo recently where Niklas Zennström, co-founder of Skype, and CEO and founding partner of Atomico joined as speaker. When asked what he likes about Japan, his answer was love for technology and innovation, seeks for high quality. 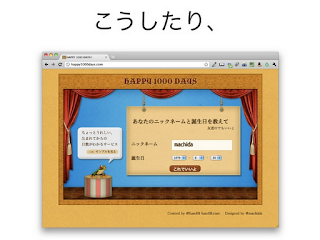 "Japan was the leading the world on broadband, and I knew the world will be following Japan. I saw that in mobile too." He continued though, that "making a good product is much more important than the technology itself." 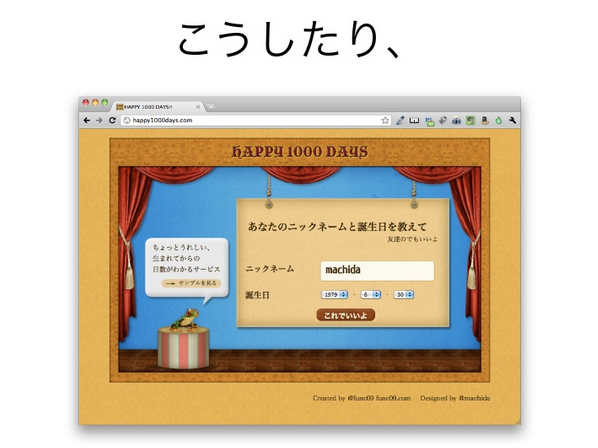 Make good products, make good UIs that are easy for the users to use. At The New Context Conference, Joichi Ito, director of MIT Media Lab spoke about how China is strong at hardware manufacturing, US is strong in software development, and Japan has strong users. Which sort of resembles what Niklas mentioned- the Japanese users loves interesting and innovative stuff, cool stuff, demands high quality, and Japanese developers and makers are all exposed to this strong demand and desire for quality which pushed Japanese production to high quality. At Google For Entrepreneurs Week in Tokyo, Kentaro Tokusei, product management lead at Google Japan says "If you are able to satisfy Japanese users, you have a chance to be successful globally"and pushed the audience (entrepreneurs) forward by telling them "If you wish to do so, you can change the world." Go go > Japanese developers! 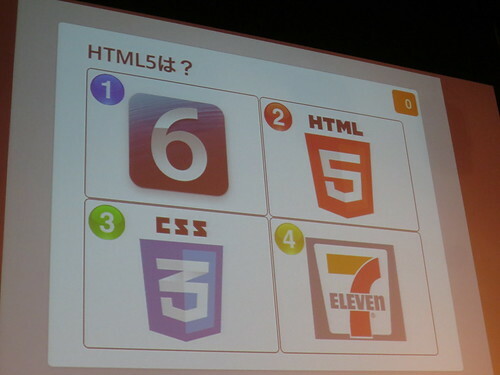 On 9/8, I went to join the Festival of Web developers in Japan- HTML5 Conference 2012 [ja]. HTML5 developer/designer community "html5j[ja]" is also growing rapidly -Google Groups[ja] surpassed 5,000 members and growing. Time table and all of the session slides and videos can be seen here[ja]- although all of them are in Japanese. 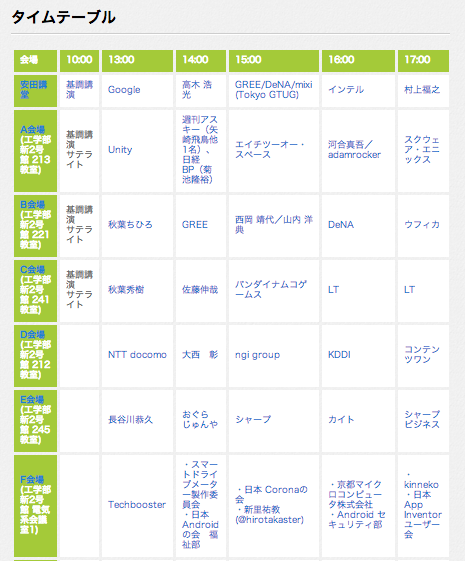 If you are interested in what Japanese developers are interested in now, the top 3 was WebIntents, WebGL/Three.js, and WebRTC. 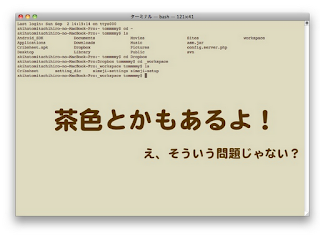 "WebGL and Three.js" by @yomotsu. 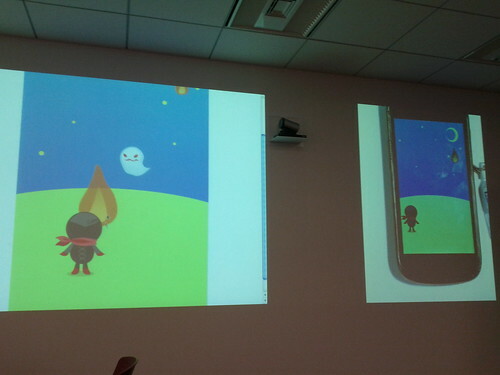 Twitter was abuzz (including those who weren't at the venue) with his demo controling MikuMikuDance using Three.js. 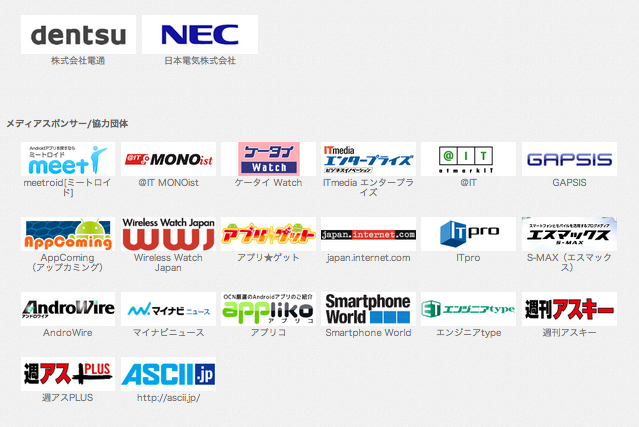 He introduced many other cool stuff- including JSARToolKit - note that Japanese developers loves AR (augmented reality). and watch this video "Chrome Office Hours: Movi Kanti Revo—Behind the Divs"
The programs in the hall started with the keynote, continued by a session by @myakura entitled "HTML, CSS and APIs" - slides and video, then there was the session "Web design in the HTML5 era". Then, some panel discussions continued including "The viewpoint of the experts in the state of the art Web", and 2 hour long panel covering "The game developers who tackle the next generation Web technologies" first half and second half, followed by the special sessions and Lightning Talks. 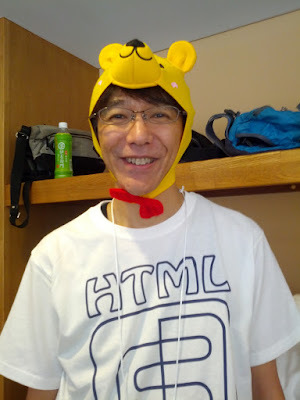 Some of the sessions from developer track includes "The forefront of tough mobile development using HTML5" by @tkihira. 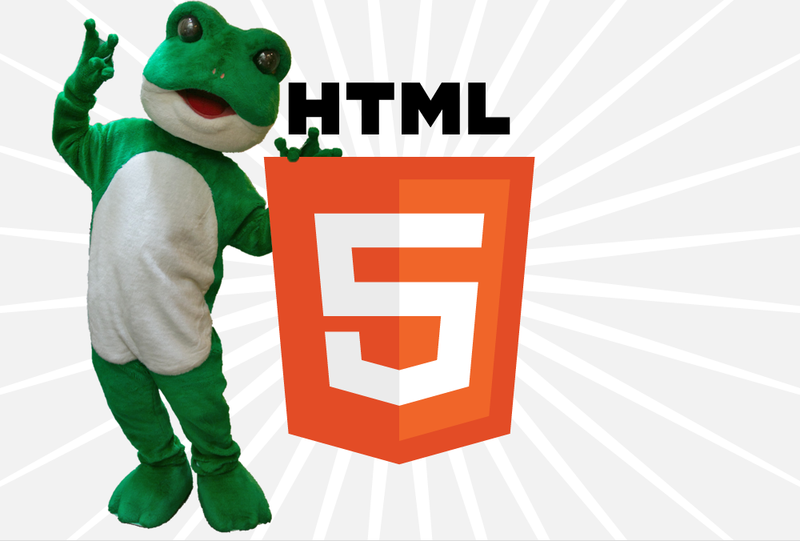 Video here- quote "the forefront of mobile HTML5 is how to use Canvas / CSS3 and make the speed faster". Mobile web is super important in Japan, so this session seemed to be very popular. 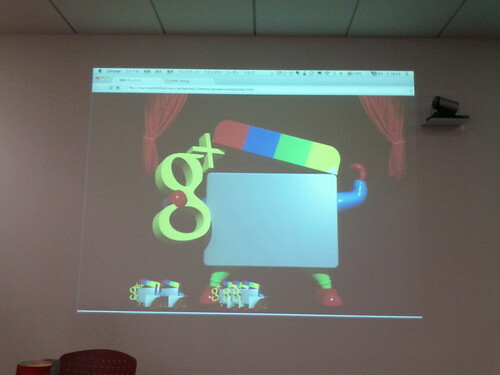 Others included "What's new in Chrome Apps / Extensions?" by @agektmr (slides and video), "Customizing jQuery Mobile" by @yoshikawa_t (slides and video), "HTML5 and IE10 and Windows8" by @ykasugai, "How to make lightweight web applications" by @os0x (slides and video). When you look at the source of various famous websites, you start seeing odd stuff that you as developer would rather learn not to do... @futomi did a session called "Collection of weird HTML5 markups"- video and slides. Other sessions from designer track included "Sass", "Evolution of CSS and new web tool", "User Interface Design Pattern With CSS3" and "Technical artists in gree that supports the smartphone games geared toward the world". Apart from the WebIntents, WebGL and Three.js, WebRTC sessions mentioned above, this track included "How to create parallax and responsive website using jQueryMobile" by @shumpei (slides and video), and "HTML Web Platform" session. 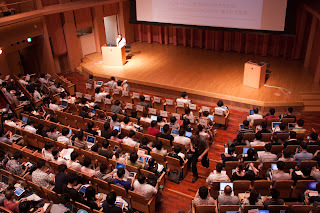 Last year's conference was co-hosted by html5j community and Google Japan- this year, in the spirit of the community "Connect, learn, and get excited", the community reached out to a broader web world. Platinum sponsors includes Google Japan, NTT Communications, Microsoft, Adobe, CA Mobile, gree and DeNA, and many more gold/silver/special/media sponsors. Thanks to all the sponsors for making the event happen! HTML5 paper tattoo and github stocking. 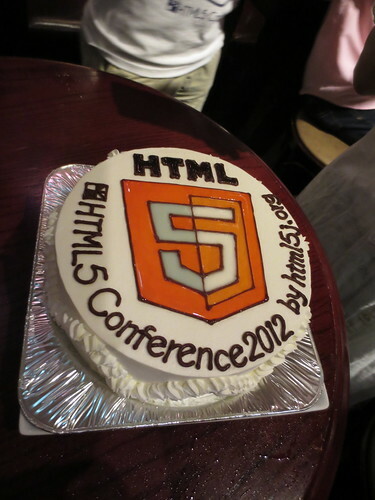 HTML5 cake and CSS3 cake. 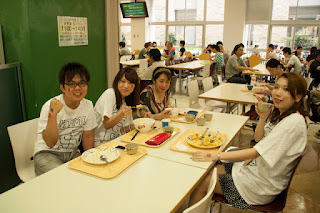 Lunch in school cafeteria- not something you can experience everyday! Press article list and summary of tweets. 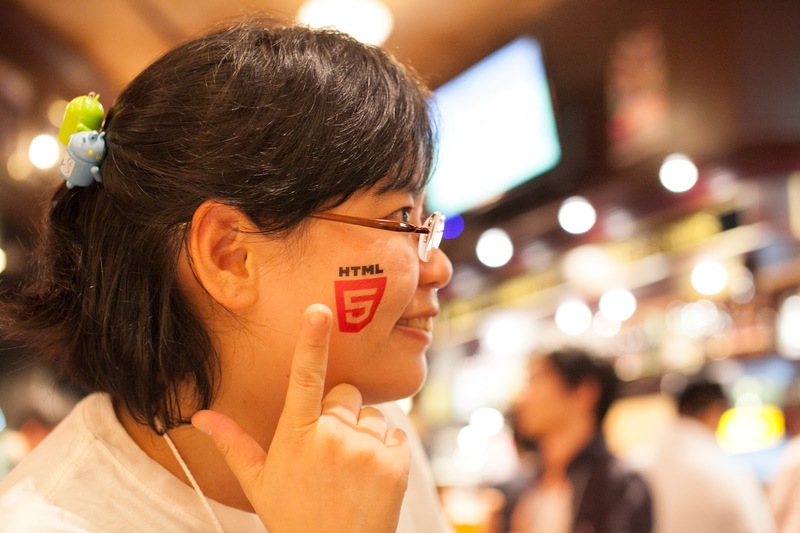 It was great to see the HTML5 community in Japan to expand, and the Conference to be supported by so many developers, companies and participants - the developer ecosystem. Thanks again to all the staffs, volunteers, speakers, sponsors and participants for making such a wonderful and successful conference!! 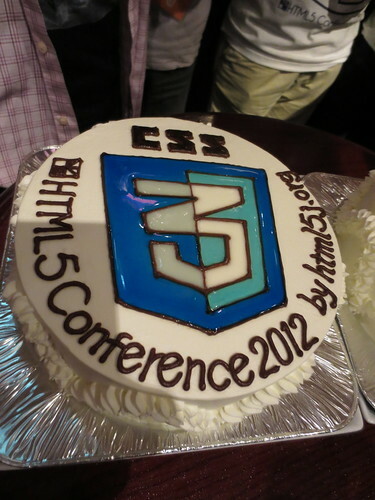 "html5j" is the community that organized this conference- in addition to that, they have been hosting monthly study groups solely on HTML5 with average 100 participants per session. Every. Single. 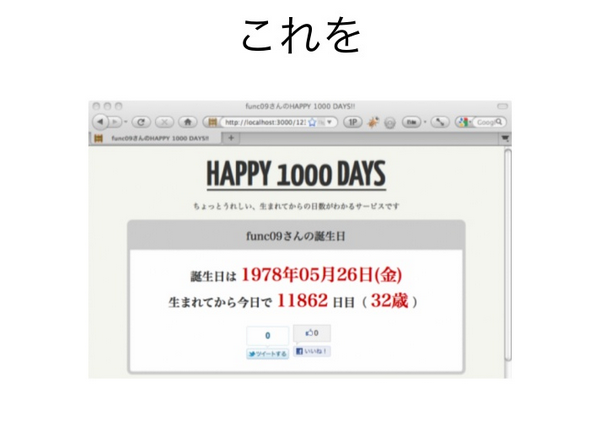 Month. Amazing.